We are sorry that this item is out of stock, and further stock is not expected soon. Popular Inca Inchi has released with original label. 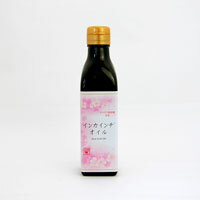 Rich in Omega 3, this plant derived oil is good for both eating fresh or cooking with heat. Less oily texture and fresh flavor of unripen fruits and roasted nuts draw out the deliciousness of other ingredients. Even though you eat with fresh, it has clear finish. As including much of natural antioxidant component, Vitamin E, you can use with stir-fried food. Good for salad, boiled vegetable, and bread. You can also use for any dishes such as dressing, juice, Carpaccio, pasta, stir-fried food, and so on. Using Inca Green nuts seed oil with a traditional way of cultivation in Amazon. Pressed oil out of the seeds in cold press way without using any chemicals. After that, it is filtered and packed. Thus you can get quite natural oil. In Peru, people call Green nuts “Sacha Inchi”, known as old plant origin used since before Christ. Even now, used widely for various way; food and improvement in beauty and health. *No additives such as antioxidant, non-GMO ingredients are used. -Storage: keep in refrigerator after opening and consume shortly. Part of the components from the ingredients can get cloudy or settle at the bottom, but there is no problem on the quality.